This article was written by Jennie Rose Halperin and originally appeared on the Creative Commons Blog. This is the second part in a two-part series is republished under a CC BY 4.0 license. Read the first part of the interview here. 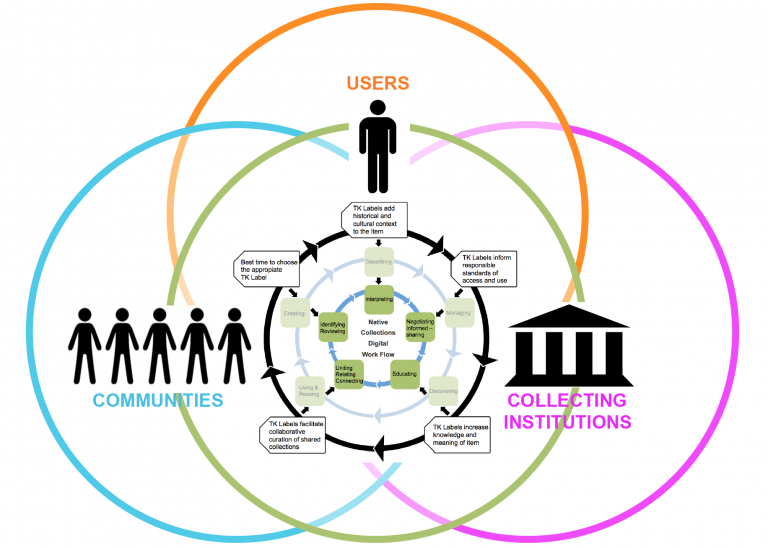 Creative Commons (CC): How does information colonialism impact the communities where you work? How are you working to mitigate exploitation of cultural resources? Jane Anderson (JA): Information colonialism is an everyday problem for all the communities with whom we work and collaborate. It is not only the legacies of past research practices, but how these are continued into the present. There are more researchers working in Indigenous communities now than there were at the height of initial colonial documenting encounters from the 1850s onwards – and the same logics of extraction through research largely continue. This means that many of the same problems that we are trying to address in Local Contexts – namely the making of research derived from Indigenous knowledge and participation often conducted on Indigenous lands as owned by non-Indigenous peoples – continues. CC: The 6 CC licenses are designed to be simple and self-explanatory, but there are 17 Traditional Knowledge labels and four licenses, creating an intentionally local and culturally dependent information ecosystem. As a project both inspired by the Creative Commons licenses and in conversation with them, how do these labels better serve the contexts in which you work? JA: The 17 TK Labels that we have reflect partnerships that have identified these protocols as ones that that matter for communities in the diverse circulation routes for knowledge. What is important about the TK Labels part of the Local Contexts initiative is that they are deliberately not licenses. That is, we are not limited by the cultural (in)capacities of the law. Indigenous protocols around the use of knowledge are nuanced and complex and do not map easily onto current legal frameworks. For instance, some information should never be shared outside a community context, some information is culturally sensitive, some information is gendered, and some has specific familial responsibilities for how it is shared. Some information should only be heard at specific times of the year and still for other information, responsibility for use is shared across multiple communities. CC: What is one interesting outcome of your recent work? JA: One of our most important recent projects has been working with the Passamaquoddy Tribe to digitally repatriate and correct the cultural authority that the Passamaquoddy people continue to assert over the first Native American ethnographic sound recordings ever made in the US in 1890. When these recordings were made by a young researcher who visited the community for three days, they functioned as a sound experiment allowing for greater documentation of Indigenous peoples languages and cultures. The recordings were never made for the Passamaquoddy community but for researchers in institutions. This is evidenced by the fact that these recordings were not returned to the community until the 1980s – some 90 years after they were made. When this initial return, on cassette tapes, happened in the 1980s, the quality of the sound was poor. For community members thrilled to hear ancestors again after so long it was simultaneously heartbreaking not being able to hear what was being said. JA: At an international and national level, the TK Labels are an intervention directed at the level of metadata—the same intervention that propelled CC licenses to the reach they have today. Our current work at Local Contexts is threefold. We are finalizing the TK Label Hub. This will allow for a more widespread implementation of the TK Labels. It will be the place where communities can customize their Labels and safely deliver them to the institutions that request them and are committed to implementing them within their own institutional infrastructures and public displays. Our current work with the Abbe Museum in Maine will see the TK Labels integrated into the Past Perfect software as well, allowing for implementation across a wide museum sector. We continue to expand our education work on IP law and Indigenous collections for communities as well as institutions. More generally we believe that any education on copyright must have the history and consequences of excluding Indigenous peoples from this body of law incorporated into how it is taught and understood.